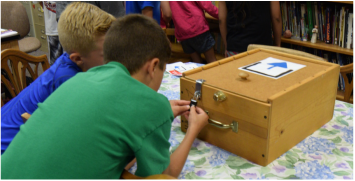 Breakout EDU is a platform for immersive learning games. Games that teach critical thinking, teamwork, and complex problem solving. And these games can be used in all content areas. ​Each game is designed so that players are immersed in the experience as they race against the clock. Kids from 7 to 107 will enjoy solving the clues and "breaking out" of the box. Take a look at all the games that have been created on the official Breakout EDU site here. Sign up to become a beta tester (and receive the password to access the game details) here. Don't worry about obtaining a kit, we have some kits available for use within district. Just fill out the beta tester form and you will receive an email with the password to access the game details. Contact Carol if you would like more information or would like to use a kit. ​We currently have three complete kits to loan out! Carol will set all of your locks, provide needed materials/copies, and provide any desired training. Try Breakout EDU Digital! You can check out all of the digital games here. All you need to play is an internet connection and a device! These will be a challenge, as no answers are given and they vary in difficulty levels (the higher the number the greater the difficulty). Participate individually, in small groups, or as a whole class.